Earn $6.04 in Rewards credit (604 points) What's This? Try your hand on Shimano's XT M8000 Front Shifter and you'll quickly realize this is the crispest and most refined Deore XT shifter yet. 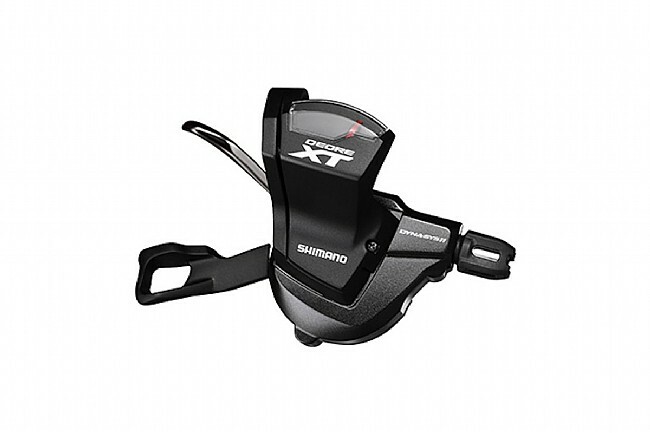 Improved ergonomics include longer, textured lever shapes like those found on Shimano's top-of-the-line XTR group, and a lighter action combined with an ultra low-friction cable means effortless shifting in all conditions. 22.2 mm handlebar mount. Switchable mechanism for use with either double or triple chainring cranksets. Compatible with Shimano side-swing front derailleurs. Also available in an I-Spec clamp version. Includes shifter, removable shift indicator with cover, low-friction cable, and cable housing.